As you know, it is not my style. Usually I don’t cook without onion. After that I was inspired to see Tagor’s favourite list and just loved the result. If someone is not comfortable to cook without onion, then just add onion. But try my recipe; I know that you will love it. 1. Wash the poppy seeds and soak it for at least 20 minutes. Make paste of it. 2. Peel off the potatoes and cut into half and wash it. 3. Cut the cauliflower into medium sizes florets and wash.
4. Heat the pan with oil and fry potatoes with pinch of salt till it becomes light golden brown. Remove potatoes from oil and keep aside. 5. Add cauliflower in same and fry it till it becomes light golden brown. Remove cauliflower pieces from oil and keep aside. 6. Make paste of ginger, coriander powder, poppy seed, chilli powder, yogurt and 2 tablespoon water. Mix well. 7. In same pan add cinnamon and bay leaf and 30 second add the spice paste. Cook it till oil is separated. 8. 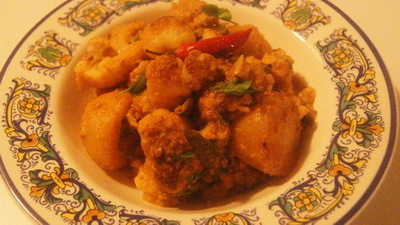 Add potatoes with 2 cups of water and after 3-4 minutes add cauliflower pieces and green chillies. 9. Cook it under close lid till potato is tender. 10. Add clarified butter and coriander leaves and remove heat. 11. Serve Aloo phulkopir Dalna / Spicy Potato Cauliflower with plain rice, paratha or luchi. What if I can’t find white poppy seed to make Aloo Phlukopir Dalna, any substitute which I can use ? Poppy seeds is kinda must but I will say that you can use almond meal instead of poppy seeds. Don’t tell anyone that I tell that. People can sue me for that.